We are happy to share our experience with others, we will be delighted to come and talk to your organization about our expertise. Design Driven Innovation Methodology: "Horeca Tomorrow" a case study about the future of hospitality's service industry. Leading Innovation Through Design: Mapping Business Models for Social Service Design in Healthcare. Co-author with Lianne SIMONSE, Sietse VIS, Evelien GRIFFIOEN, Catalina RUIZ, Andrea CROSSLEY URREGO, and Gabriella SOTO CAMACHO. Our experience starting and shaping the Visionscapers.net - the networked innovation company. Guest Lecturer at Strategic Product Design Master's Program. Leading through Design. How to increase the value of Design in business innovation. Host at the Fashion and Technology Symposium. Leader of the workshop called: Culture, Research and Innovation. 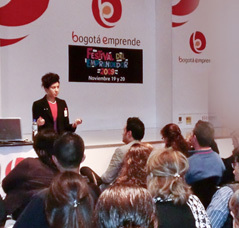 Innovation and entrepreneurship festival: "Bogota Emprende"
Presentation called: People centered innovation. Presencias del diseño: Philips Design. The Clinical Healthcare Journey. Philips Design. The Clinical Healthcare Journey. Starting Marketing and Research Talents. Invited panelist and participant to the Forum AJC by the “Quebec Office Amérique pour la Jeunesse”. Parallel between Appointing Identities and Artistic Youth in Ciudad Bolivar. And the Peer Educators Program implemented for Mary’s Center, as both are youth recognition initiatives, empowering respondents.